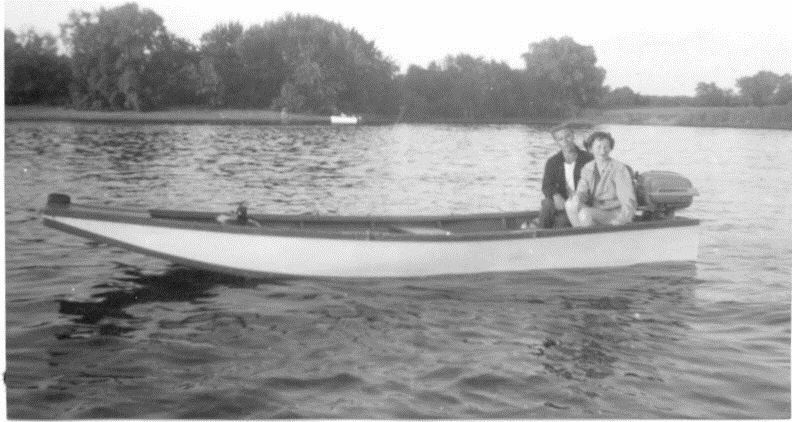 Walter and Agnes Kofta of La Crosse loved to fish in their handmade boat. The family of Walter Kofta has donated his boat to the La Crosse County Historical Society. If you were fortunate, you went out on a boat and found a place where the fish were biting and ate some pan-fried sunfish, perch or maybe walleye that night. Fishing has always been considered a leisure activity that also brought food to the table. You could say that fishing is in the blood of many La Crosse families. That was certainly true for Walter Kofta, a La Crosse native born in 1928. He grew up in La Crosse and married Agnes McCabe here. He worked at the Auto-Lite plant on the city’s north side. And Wally loved to go fishing on the river in his boat. The boat in this picture was purchased by Wally in 1952. It is a flat-bottomed wooden boat, 16 feet long, and it carries an 18-horsepower Evinrude outboard motor. Wally’s boat was handmade in La Crosse from a popular boat pattern by his friend Frank Voigt. While Voigt was not in the business of making boats, he made four more of these boats for local fishermen. Wally used his boat frequently, often taking Agnes and his family on outings. Agnes didn’t like that the boat sat quite low in the water, but she still liked going on the river with her husband and cooking the fish they caught for supper. A bit of a daredevil, Wally even took his boat out fishing when there was considerable ice in the river. He used two home-made eight-foot pikes to drag the boat through or over the ice to get to where he wanted to fish. He recalled that he once saved his friend Frank Voigt on a winter evening when Frank got trapped for three hours on an ice floe that broke away and floated downstream. Wally moved to Waterloo, Iowa, to work at the John Deere plant after the La Crosse Auto-Lite plant closed, but he often came back with his boat to fish in his home territory on the Mississippi. Walter Kofta died in 2017. His family donated the boat, motor, pikes and other related material to the La Crosse County Historical Society earlier this year. You can see the boat in the online collections database of the La Crosse County Historical Society.